When your cat's digestive system needs some rebalancing, feline probiotics are on hand. In this article we'll show you what works, and how. If I were to ask you what your priorities for the week are, keeping your cat’s digestive system in check is unlikely to make your top 5. Ask the same question to an owner whose cat is suffering with inflammatory bowel disease, and I’m pretty confident it’ll be number 1 on the list. Probiotics work to keep your cat’s digestive system and overall health in check. Keeping a good balance of healthy bacteria in your cat’s digestive system has never been easier than it is today. There’s a whole host of affordable feline probiotic supplements that do a great job it. If you’re in a hurry, we’d look no further than Purina ProPlan Fortiflora as the answer to your problems. It’s widely considered as the best probiotics for cats out there. 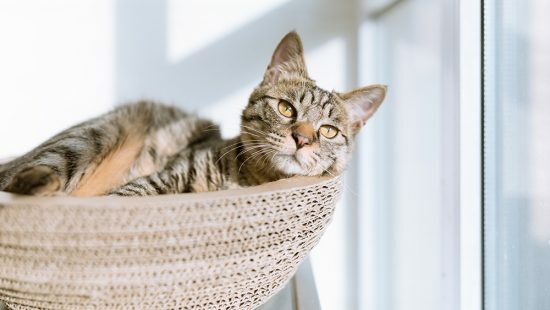 If you’re sticking around, let’s look at a few other options and walk through the benefits and risks of probiotic supplements for cats. 7.2 Can All Cats Benefit From Probiotics? 11 Do You Need Probiotics Specifically Designed for Cats? 15 Are Probiotics Really Worth the Cost? Changes to your cat’s diet should always be made with great care. Despite their seemingly resilient nature, their digestive systems are a finely balanced machine. As with all changes to routine, you should consult a veterinarian before taking the plunge. Let’s start by taking a look at some of the supplements available today. Most include a few strains of good, helpful bacteria such as Bifidobacterium that work to bolster your cat’s natural digestive process. Below are the best probiotics for cats to ensure their digestive system returns to a healthy balance of bacteria. This is the number-one recommended probiotics supplement for cats by veterinarians. 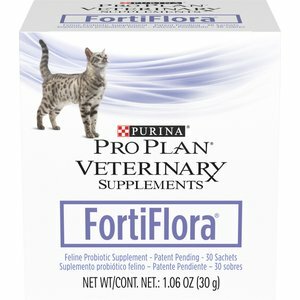 Fortiflora is one of the best for cats suffering from diarrhea, and feeding your cat this is also a good way to improve their overall health. With 43% crude protein (min), adding this to your cat’s diet will not prevent them from getting the essential nutrients they need. Cats love the taste of this nutritional probiotic supplement. Simply sprinkle it on top of their food once a day and then let them chow down. Due to the nature of the ingredients, this is a supplement that should only be given to your cat if your veterinarian recommends it. What is great Purina’s FortiFlora is that they guarantee the number of live cultures in their product. Since it is these live bacteria that will restore your kitty’s digestive system and promote normal digestive enzymes, it is important that there is enough in every dose you give them. Each packet represents one daily dose. You can buy boxes of 30, 90, or 180 packets. 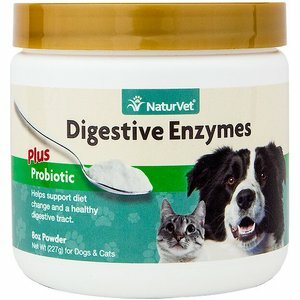 Here is another top probiotic for cats option that provides your cat with key nutrients required to produce digestive enzymes and other great health benefits. It has ingredients that can help your cat’s digestive system break down starch, cellulose, protein, and triglycerides. Of course, there is also a good serving of probiotics that help your cat absorb nutrients efficiently. This is a great product because it is safe for any cat over 6 weeks old. You simply add 1/4 of a rounded teaspoon to every meal you feed them. This product can easily be added to wet or dry food. Each dose is guaranteed to have each and every ingredient in it to make sure your cat is getting everything they need to be healthy and happy. People love that this product is made in the USA at a Good Manufacturing Practices compliant facility. If you are not happy for any reason, the manufacturer will refund your money. This digestive aid has everything you want with nothing you don’t. There are plenty of probiotics, no artificial colors, flavors, or wheat or dairy. You will also find no fillers in this product. It is another product that is safe for cats over 6 weeks of age. It is easy to add this product to your cat’s diet. Coming in powder form, you can add it to wet or dry food. You can even add it to your cat’s water, although that isn’t ideal if you have multiple pets. Each tub of this product has enough for 120 doses of probiotics. The manufacturer recommends giving your cat a half dose for three days before graduating to a full one. The makers of this product have carefully selected 6 strains of bacteria that are beneficial for cats. They are designed to help your cat’s digestive system maintain a healthy level of flora. With this product, your cat will get a whopping 11 strands of bacteria to help maintain your cat’s digestive health. This product is organic and contains a guaranteed number of living cultures. The formula was specially designed by a veterinarian to work with the unique needs of a cat. This is a tasteless product, making it one of the best cat probiotics to easily to sneak into your feline’s food. There are absolutely no fillers, preservatives, or additives in this product. It is a vegan-friendly product that has no soy, dairy, wheat, corn, or gluten. This is one way that this product stands out from many others currently on the market. 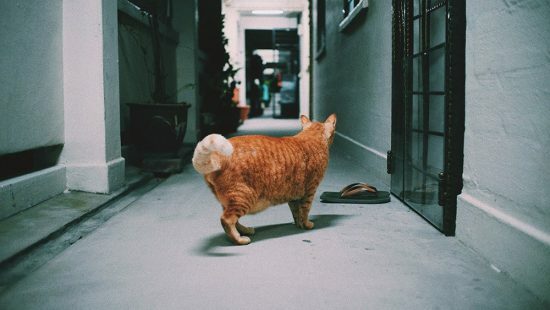 The amount you feed your cat depends on their weight. The National Animal Supplement Council gives this product their seal of approval. This council enforces the Good Manufacturing Practices Quality Standards. There is also a 100% satisfaction guarantee in case this product does not live up to your expectations. Here you have another all-natural option that is made in the USA. The product is made in a Good Manufacturing Practices facility and tested by a third-party to ensure safety and quality. Its careful development has led to this cat probiotic supplement being recommended by vets everywhere to improve your cat’s digestive health. It is both odorless and tasteless, making it easy to feed to your cat. The manufacturer of this product claims it is superior to any product that will work for animals other than cats. That is due to the unique dietary needs of a cat. The formula of this product has living bacteria that has been proven to increase the good flora and bacteria in your cat’s digestive system. What is great about this formula is it was designed to not be affected by heat, air, or moisture. The organisms can survive all of those conditions. You do not even technically need to refrigerate this product, although the manufacturer recommends you do. Research has been showing the link between bacteria and digestive health, not only in humans, but also in their furry companions. Adding probiotics to your cat’s diet may help improve their “gut health,” which can improve their immunity and make them healthier and happier overall. Before adding anything to your cat’s food, however, it is important to do careful research. Can all cats benefit from probiotics? What conditions do they treat? Which products are best? This guide is designed to help you answer these important questions. First things first, it is important to understand what cat probiotics are. Simply put, they are living organisms. They are either bacteria or yeast. Even though bacteria are normally thought of as a bad thing, there are a ton of “good” types that are essential to your health. The same is true for your cat. There are many different strands of bacteria that are considered helpful to your cat’s digestive system. Supplementing your cat’s diet with probiotics can help to balance the “good” and “bad” digestive enzymes in their system. Can All Cats Benefit From Probiotics? Ultimately, the best person to ask about your cat’s specific health needs is your veterinarian. That being said, there are many vets who recommend adding them to every cat’s daily routine. 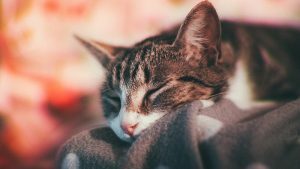 Since they boost your cat’s immunity and have very few known side effects, there seems to be little harm to adding them in reasonable quantities. The only thing to keep in mind is your cat needs to be 6 weeks of age or older before being supplied with cat probiotics. The biggest area of improvement after introducing probiotics will be in your cat’s digestive system. Probiotics are great for treating diarrhea, vomiting, decreases in appetite, and gas. There are many reasons your cat’s digestive tract might be out of whack. Inflammatory bowel disease and certain other sicknesses may cause the bacteria balance to shift. It is also possible that your cat ate something they shouldn’t have. Just like in humans, the immune system of the cat is closely linked to the health of their digestive tract. A healthy digestive tract produces digestive enzymes that break down food and protect your cats immune system. As a result, when you balance the bacteria in their belly, you are helping them fight off illnesses and live a longer, happier life. If your cat has a problem with their heart, your veterinarian likely has them on a low-fat diet. Adding probiotics has been shown to reduce both total as well as LDL cholesterol levels, easing the strain on your cat’s heart. 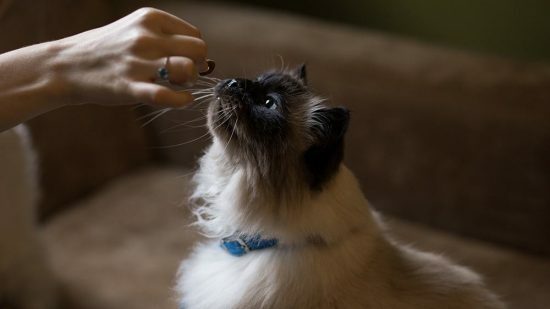 Although no one is sure why yet, research has shown that there is a noticeable correlation between introducing probiotics to a cat’s diet and a lessening of skin and food allergies. Even though they do not cure the condition, they can go a long way towards improving your cat’s quality of life. It may seem weird that your cat needs to recover from something that helped them recover. The reality is, antibiotics are notorious for destroying the balance of bacteria in a cat’s digestive system. Many veterinarians recommend to follow up antibiotics with probiotics to restore healthy amounts of bifidobacterium bifidum and enterococcus. Bifidobacterium bifidum: The bifidobacterium bifidum family of strains lives in the small intestine. It is heavily involved in your cat’s digestion. Enterococcus: This family of strains hangs out in your cat’s large intestine, better known as their colon. It aids in the formation of “normal” feces. Although there are several other types of bacteria that are helpful, it is important that any product you buy has those two. Ideally, the product will have a few strains from each family. This is particularly true if you are trying to treat existing issues with the digestive system. It is never a good idea to randomly throw something new at your cat’s system. The first thing you will want to do is have a conversation with your veterinarian; assuming it was not their idea in the first place. They will be able to give you recommendations for probiotics based on your cat’s specific needs. As a bonus, they can help with tips on how to get them into your cat’s system with the least amount of struggle. They can also clue you in on any side effects that typically arise from cat probiotics that you should watch out for. Once you have found your product, be sure to follow the directions carefully. The proper way to add it to your cat’s diet will vary depending on the product. Some supplements will want you to give your cat a half dose of probiotics for a few days to let them adjust to it before upping to the full dose. Be warned, a common side effect of introducing probiotics can be diarrhea. This is why it is important to follow the directions on the packaging as well as consult your vet. It may be impossible to eliminate this side effect entirely, but these steps can help minimize the problem. Do You Need Probiotics Specifically Designed for Cats? There is still a lot of research that needs to be done into the relationship between bacteria and digestive health. It is known that cats and dogs have many differences in their digestive tract. The inner lining of their stomachs, for example, are very different. A product that works great for dogs may not be one of the best probiotics for cats. So far, there is no research saying that supplements aimed at humans or dogs would be harmful to your cat. That being said, many manufacturers spend a lot of time and money finding the best strains of bacteria for feline health. Rather than asking yourself if you need a product designed for cats, ask yourself, why not use a product designed for cats? Most commonly, you will find feline probiotics in powder form. This is often the easiest way to get it into your cat’s system. It can be added to their food and is usually odorless and tasteless. Tricking your cat into taking a supplement is likely the best way for both of you. Powders are great because they can pack the most live cultures in per scoop. They are also long-lasting, assuming you store them correctly. Like most supplements, you can also get probiotics in pill form. If this is more appealing to you, consider getting a “pill-gun” or pill pockets to help get them into your cat’s stomach without too much hassle. You will want to carefully read the ingredient label on any supplement you give your furry friend. On top of looking for “good” bacteria, be sure the product is natural. There is no need for artificial colors or flavors. The best probiotics for cats need nothing other than the living bacteria. To be safe, check to make sure the product is free of known-allergens and anything else you do not want your kitty having. Although generally considered safe, even completely natural probiotic supplements for cats are not without their risks. As mentioned above, diarrhea is a common side effect until your cat adjusts to the new bacteria in their system. The main risk with probiotic supplements for cats is the same as supplements for humans. Unfortunately, the supplement industry is not closely regulated. There are no requirements that they have to back up the claims they make on their labels. This is why it is important to look for products that submit their products to third-party testing. Being made in the USA in a Good Manufacturing Practices facility is another way to improve your odds of getting a high-quality product. Are Probiotics Really Worth the Cost? While not terribly expensive, adding probiotics to your cat’s diet is definitely adding an expense to your life. While many people see great improvements, some notice hardly any at all. The best way to know if probiotics are worth it for your cat is to try them out and see. Remember, if you decide to quit giving them to your cat, you should wean them off rather than stopping them abruptly. Your cat’s stomach will thank you for it. Adding probiotics to your cat’s diet may be a great way to solve existing conditions, or prevent ones from starting. Remember, your veterinarian is a valuable resource when deciding to make any changes to your cat’s life. The majority of experts seem to agree that dental treats can play a part in keeping your cat's teeth clean and healthy. We set out to find the best around. Deworming a cat that has a mild parasite infestation can be done at home using an over the counter cat wormer. This post will teach you which to use and why. Hookworms infestations are one of the most common worm infestations in cats. Learn how cat's contract hookworms, the effects they have on their health and how they're diagnosed and treated.